Combining speed, automation, and safety, the Fellowes Jupiter 2 125 Laminator is ideal for schools and large office environments. Exclusive InstaHeat Technology allows the laminator to warm up in about a minute, while a robust six-roller system provides fast, high-quality lamination at 30" per minute — making this one of the fastest laminators on the market. The Jupiter 2 has the ability to laminate hot pouches up to 10 mil thick as well as cold pouches. A proprietary AutoSense system detects pouch thickness and self-adjusts to the optimal lamination setting. A pouch starter kit is included with the machine (additional pouches are sold separately). In the event of a misfeed or overload, reverse mode allows pouches to be easily re-centered or removed. An auto shutoff safety feature prevents overheating and saves energy. 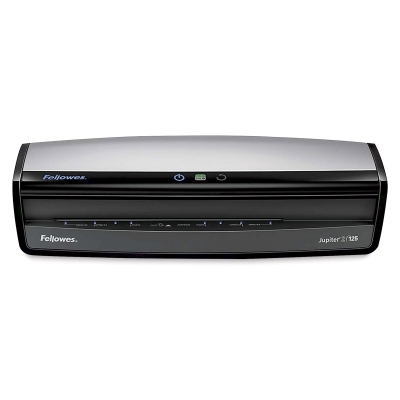 The Fellowes Jupiter 2 125 Laminator features a black/silver plastic casing and measures 5"H × 21¼"W × 8"D. The 12½" entry width accommodates multiple document sizes. This machine is covered by a two-year manufacturer's warranty. ® Fellowes is a registered trademark.™ Jupiter is trademark. ™ InstaHeat is a trademark. ™ AutoSense is a trademark.